These dry erase cork boards, also known as combination boards, include traditional cork surfaces and write-on boards. The message displays feature an open face design that allows for quick posting and writing. 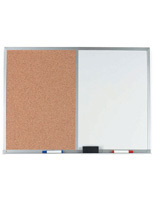 Whiteboard bulletin board combos are ideal for maximizing utility when it comes to limited wall space. Any time you need a cork board and a dry erase or chalk surface but don't have the space to get both, just get a chalk or dry erase cork board. The clever design combines a write-able surface (either traditional chalk or marker) and a tackboard for posting notices and writing custom messages. Each whiteboard bulletin board creates a unique wall display for any location! 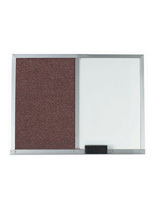 These combo boards are often used in offices, schools, and other public areas for taking notes and displaying messages simultaneously. 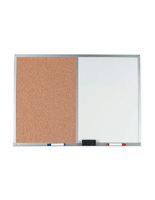 Just one dry erase cork board provides the functionality of two separate boards. Add that functionality to a durable construction and you'll see why these solutions are so practical. 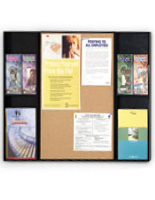 Many of these combo bulletin boards are manufactured using strong yet lightweight aluminum framing. 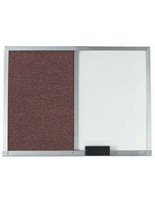 Similarly, aluminum strips divide the whiteboard bulletin board frames into two halves. Combination information boards, also called combo boards, are exceptionally versatile with dual functionality! One side of these chalkboard cork boards is a green chalkboard while the other side is a corkboard. 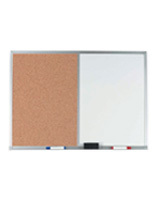 Likewise, the dry erase cork board features either a wet or dry erase marker surface combined with a tradtional tackboard. Either option is sure to give you the practicality you need in the office or classroom. Shop a variety of different frame finishes, materials, and sizes to find the whiteboard bulletin board combo that is best for you! Why is this dry erase cork board better than regular corkboards? These combination bulletin boards with dual functionality can be used for taking notes and delivering messages at the same time. A dry erase cork board can improve efficiency at your location. Combo boards allow you to save money and space. A marker or chalk cork board serves more purposes at any location. These write-on boards with fabric or cork boards are unique information displays. 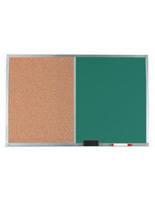 All of the dry erase cork boards in this category have either oak or aluminum frames. The combination boards come in different sizes to fit all your needs and feature different tackboard materials, like regular cork or fabric covered cork. A dry erase whiteboard with a natural cork surface is so versatile that similar units are widely used in all kinds of environments. Why not use the combination boards to not only cut your expenses by half, but also save your space on walls? The choice is simple when you can spend money for one board and you get two! These presentation boards are easy to install and fully utilize your space. The posting area is made out of natural cork, which has a self-healing design. This design is rugged and long lasting, so the user can add or remove thumbtacks and pins repeatedly without wearing the material out. 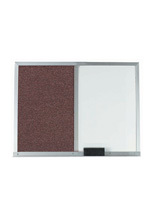 The boards can be matched with a dry erase or a chalkboard, so customers can choose whichever is more comfortable. Some educators and business professionals enjoy the classic feel of chalk while others like the quicker erase time of whiteboards. These boards serve as helpful communication centers, which makes them perfect for educational environments, meeting rooms, and other areas that encourage deep thought. Users can easily post a bright graphic on one side or tack some pictures to promote a trip while adding a personal note to the other side. The versatility of these combo boards is endless! 8am - 8pm Eastern Time US!